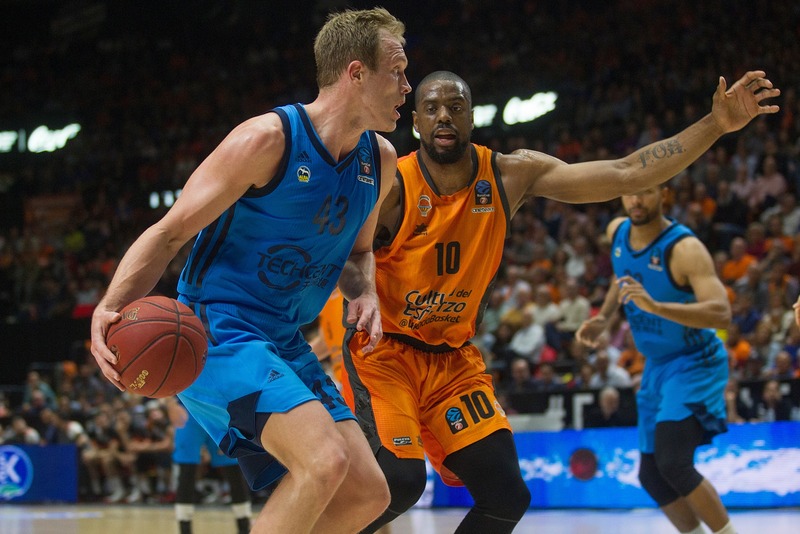 With the season on the line, the reigning 7DAYS EuroCup MVP Luke Sikma stepped up in a major way, helping ALBA Berlin pull out a thrilling 95-92 overtime win over the visiting Valencia Basket, and in the process earned himself the Finals Game 2 MVP honor. Sikma scored 7 of his 15 points in overtime, including an important three-pointer, and key free throws that sealed the win. Sikma also pulled down a game-high 6 rebounds, dished 4 assists, and had 1 steal and 1 blocked shot, accumulating a performance index rating of 20, the highest on ALBA. The highest PIR in this game, 21, belonged to two Valencia players, Sam Van Rossom and Fernando San Emeterio. Van Rossom netted a game-high 22 points on 6-for-8 three-pointers, along with 3 rebounds and 3 assists, while San Emeterio scored 16 points, drew 9 fouls and made 10-of-12 free throws. Van Rossom was the top scorer of Game 2 with 22 points. ALBA’s Peyton Siva remains at the top of the season rankings, averaging 15.3 points per game. Sikma led all players in the second game of the series with 6 rebounds. Jalen Reynolds of Zenit St Petersburg remains the top rebounder this season with his average of 8.1. Siva and his teammate Martin Hermannsson each dished 6 assists to lead all players in Game 2. Siva leads the season rankings with 8.2 per game. Siva and Valencia’s Aaron Doornekamp each collected 2 steals on Friday night. ratiopharm Ulm's Javonte Green is still the best player in that category this season with an average of 2.5. The lone block in Game 2 was by Sikma. Mathis Lessort of Unicaja Malaga tops the leaderboard with 1.3 stops per game. Euroleague Basketball (EB) is a global leader in the sports and entertainment business, devoted to running the top European competitions of professional basketball clubs under a unique and innovative organizational model. Owned and administered by some of the most successful and historic clubs in the world, EB manages and organizes the continent’s two premier men’s basketball competitions, the Turkish Airlines EuroLeague and the 7DAYS EuroCup, as well as the sport’s premier under-18 showcase, the EB Adidas Next Generation Tournament. The EB competitions bring the elite of European basketball to all five continents and to the entire sports community through the OTT platform EuroLeague TV. EB also organizes a series of community and educational programs. Its ground-breaking corporate social responsibility program One Team features 40 clubs that have already made a difference in the lives of over 16,000 participants. Its Sports Business MBA trains future professionals in sports management.